In many magical traditions, it is considered important to purify or cleanse a space before any sort of ritual can take place. There are several different ways of doing this, and how you do it will depend in part upon the rules or guidelines of your tradition. If you're a solitary, or your tradition is eclectic, then you may choose the method that works best for you. Typically, when an area is ritually purified, it is done in a clockwise, or deosil, direction, but this may vary from one tradition to the next. Here's how to get starting cleansing and purifying your sacred space. With smudging, you can use sage, sweetgrass, or other herbs. You can also use incense, if you like. 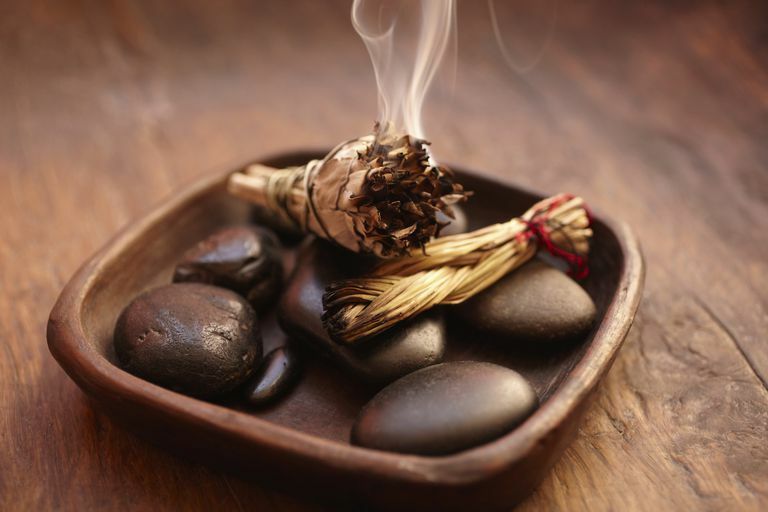 The purpose of smudging is to use smoke to carry negative energy out of the area. When you light sage or sweetgrass, allow it to flame for a moment and then blow out the flame. This will leave you with a burning herb bundle, which will create smoke. You can even make your own smudge sticks! "Go clockwise around your house (usually starting at the front door), and gently wave the smoke into the air. Spend a bit more time smudging the room corners, as they tend to accumulate stagnant energy. Be sure to also open the closet doors and carefully smudge inside. Do not forget about spaces such as the laundry room, the garage or the basement." In some cases, you may wish to use asperging as a method of cleaning a space. Asperging means using liquid, or the power of water, to purify the area. Although this is typically done by sprinkling consecrated water around the perimeter of the space, you can also asperge with milk, wine, or either of these blended with honey. In some magical traditions, water or other liquid is consecrated by placing it out under the moonlight, charging it with the power of the sun, or even by adding sacred herbs and stones to it. If you're asperging your space with liquid, don't just slosh it around in a circle! Instead, place it in a bowl, dip your fingers into it, and lightly sprinkle it as you walk the perimeter. Not only is this more meditative than just flinging water everywhere, it's also much easier to clean up if you're using milk, honey, or wine. Typically, the broom is associated with cleaning and purification. You can use a broom or besom to go around the edges of the space, sweeping negativity away as you go. It's a good idea to start and finish near a door, so that negative energy can literally be swept outside. Try making your own besom, or broom, for ritual cleansing purposes. You may even want to do a bit of chanting as you sweep, just to help send any residual negative energy out the door! Keep in mind that if you're using a broom for magical purposes such as cleansing and purification, you shouldn't be using that same broom to physically clean your house. Instead, have a besom dedicated specifically for magic and ritual. Salt has been used for purification for thousands of years. Use a bowl of sea salt, sprinkled around the area, to cleanse the space and make it sacred. Some people like to use salt crystal lamps as well. Like any other purification item, you should consecrate your salt prior to sprinkling it around; otherwise, you're just making a mess, and you won't really be cleansing anything metaphysical at all. "The reason salt must be consecrated first before using in this way is because salt has a tendency to naturally absorb energies, including negative ones. In fact, salt is one of the most powerful natural absorbants of negative energies–that's why it works so well in cleansing, purification and exorcism rituals. Salt that is not consecrated absorbs negative energies just sitting on the shelf." In many cultures, fire is used to ritually purify and cleanse a space. You can do this by lighting a candle and walking the area, or sprinkling cooled ashes around the perimeter, although this can be messy to clean up if you're inside! By walking around the area you're purifying, with a small fire burning in bowl or dish, you can destroy anything negative that may have built up. You can also light candles and place them in the four corners–north, south, east, and west–as you perform ritual or spellwork.